Frustrated Newcastle Jets coach Phil Stubbins concedes his side won’t be able hold on to leads and win matches unless they can fix a few mental issues. 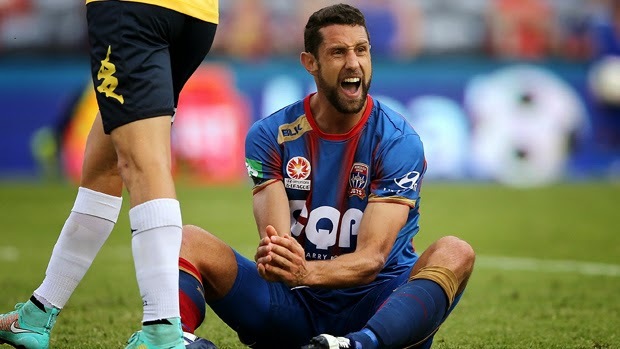 The Jets slumped to their worst ever start to a Hyundai A-League season, held to a 1-1 draw by local rivals Central Coast Mariners at Hunter Stadium on Sunday. Despite taking the lead early in the second half through Edson Montano, the home side was pegged back by a Richard Vernes strike just seven minutes later. It’s the third time this season the Jets have lead a match but been unable to hold on for victory, a huge reason why they are without a win through eight rounds of the campaign. “We got a good goal, a well taken from Edson (Montano) and then thereafter we once again slipped into the mindset of what we’ve become,” Stubbins said. “We have to change that. It’s very frustrating and we need to be better at keeping leads. “Also we must get better when there’s parity back in the game, we need to be better at being able to go on and win. We had a good week on the track, got ourselves the goal again but we just can’t seem to bring it home. Despite feeling his troops “dropped two points”, Stubbins feels there are plenty of positives and they did manage to create a number of good opportunities in front of goal. Montano not only scored with a powerful finish but also hit the post with a first-half header, while Marcos Flores also crashed a shot into the crossbar midway through the second half. “It’s very disappointing, again a home game for us, a local derby and not to pick up the three points today is frustrating for everybody,” Stubbins said. “The boys worked hard but it wasn’t to be…I’d say the draw was a fair result. Asked about Montano, who had arguably his best games in Jets’ colours and scored his second goal of the season, Stubbins said: “He’s working hard…we’re asking him to do certain things now. “It always takes time for foreigners to come here and settle. He’s got himself a couple of goals and I think he led the line in a better fashion today.